The clients acknowledged that they had little experience in the building and construction industry and felt overwhelmed by the building process. They were impressed that we could offer them a full-service fee proposal; to guide, educate and manage them through the many stages including architecture, tendering and construction. Essentially, they were seeking our “turn-key” package and were delighted we could provide this. The home takes on a simple, yet impressive form. Guests are guided into the home through the feature entry canopy. This semi enclosed canopy prepares its guests for a casual transition between the unprotected openness of the outdoors to the sanctuary of the home. Compressed fibre cement panels with expressed joints wrap the box-like geometries of the upper level. The master bedroom boldly projects, creating a bold and dominant street presence. 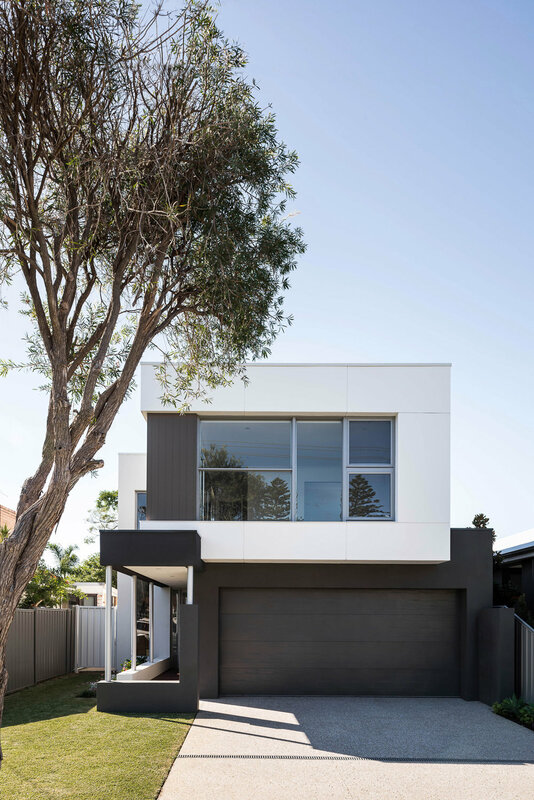 The rhythm of movement experienced through the decked entry walk-way is purposely superimposed in a vertical expression on the upper level with the use of a compressed fibre cement cladding system. 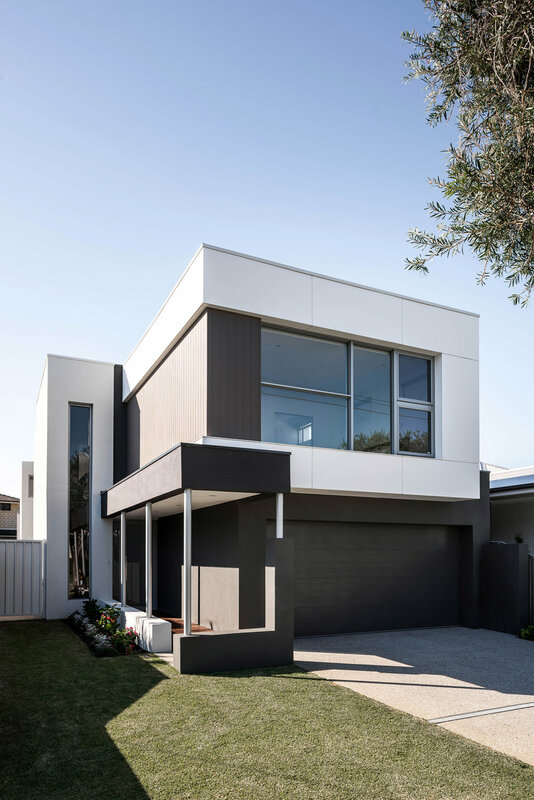 The compressed fibre cement cladding system was found to be a durable yet cost effective solution to create contrast and style to the street facade. The eclectic approach of how birds build their nests inspired the combination of different materials used in this project amongst other subtle design influences. Commercial glazing features throughout the project, to achieve simple yet noteworthy glazing configurations. The journey of traveling through the long rectangular nature of the home is broken up with open spaces, varying ceiling heights and an internal courtyard. These carefully placed features help to enlighten and refresh, what would have otherwise been very dark, gloomy and average experiences in the home. The home is equipped with generous sized rooms, ample storage and spatial relationships that reflect the family’s daily in-house activities and movements. General living areas are intentionally located on the ground floor so there could be a clear separation between what were public and what were private areas of the home. X-space architects remains proud that this project superseded the client’s expectations whilst remaining within their budget constraints.